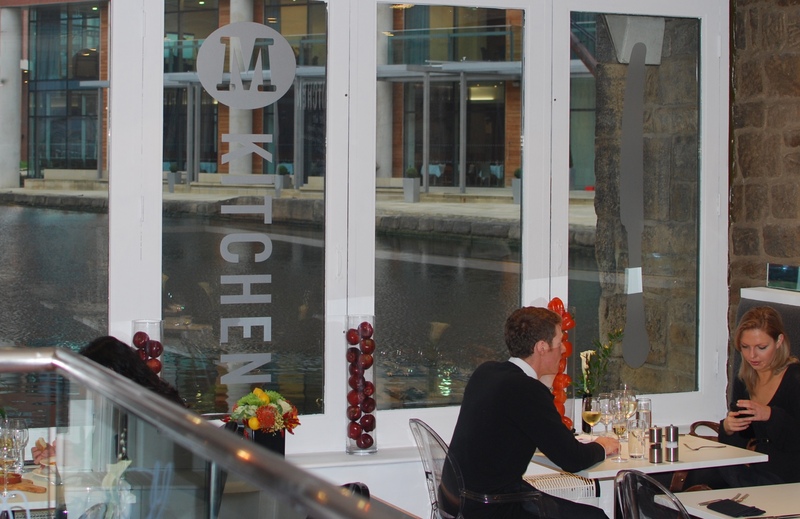 A three day pop-up restaurant at Canal Wharf in Leeds opened Yesterday, Wednesday the 16th of November before touring the UK, Birmingham, the Custard Factory and Manchester, Triangle Shopping Centre are to follow, a very interesting PR take from no other than Morrisons! The M Kitchen is a new ready to eat range put together by Morrisons with help from a remarkable line up of Chef’s, products from the range include Nigel Haworth’s Lancashire Hotpot, Aldo Zilli’s Pizza Calabrese (wish I had tried this just for the Salsiccia Italian Sausage and Nduja), Bryn Williams’ Shepherd’s Pie (with a Madeira wine twist), Atul Kochhar’s Chicken Korma with rose petals, and the even the great Pierre Koffman’s Beef Bourguignon. The setting on Canal Wharf in the old Olive Press building, currently empty, was perfect, a great location on the Leeds Liverpool canal and a ready made space for a pop-up, all be that it probably took an amazing amount of preparation for just 3 days! and the smell of fresh paint lingered a little. 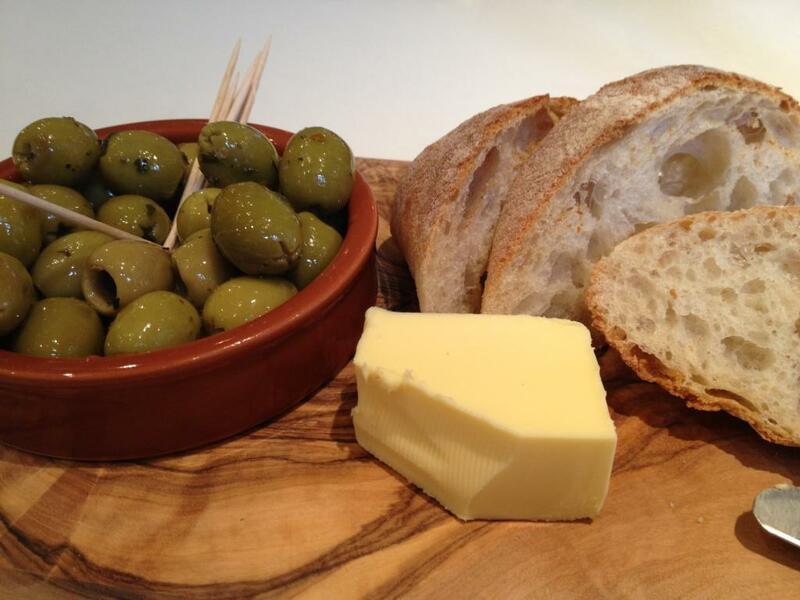 After a glass of refreshing Champagne (Morrisons own The Best Champagne Brut @ £19.99) ciabatta & olives were served at the table and our order taken, the staff are knowledgeable and are touring with the pop-up. 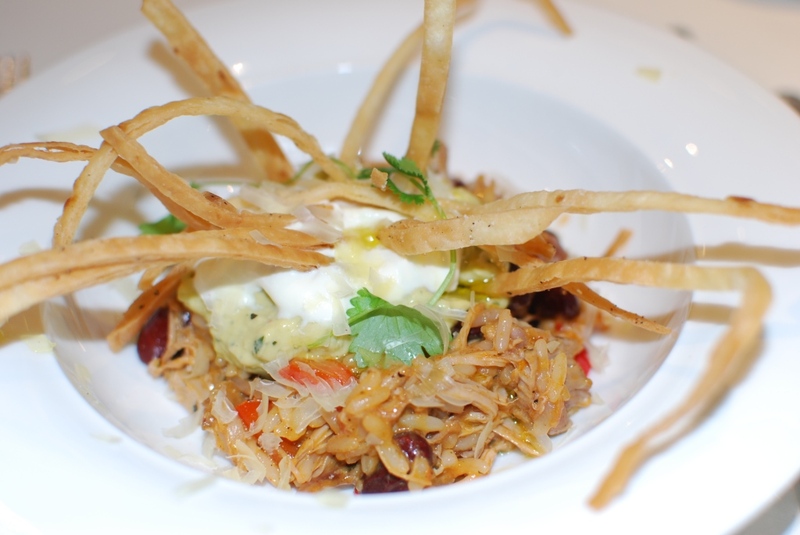 For starters I choose the Pulled Pork with rice, beans and tortillas, the divine pastry straw style tortillas a great touch. Accompanied with a fruity Kiwi Sauvignon Blanc, again from The Best Range @ £7.94 a bottle. 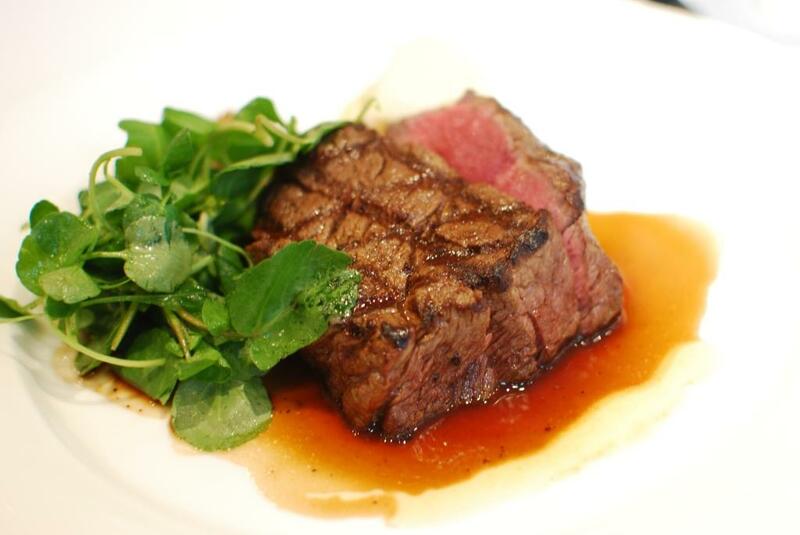 Dumfries House Shorthorn Beef Fillet Steak, really excellent, well hung, tasty, perfectly cooked as ordered, melt in the mouth steak, served with watercress, wholegrain mustard & a silky smooth mash, just wish I had noticed the side orders before I ordered! sweet potato gratin, spinach & rocket salad, sweet pea and broad bean puree and crinkle cut chips were all available. I tried the full bodied Aussie Shiraz from Geoff Merrill a good choice with the steak, £8.49. 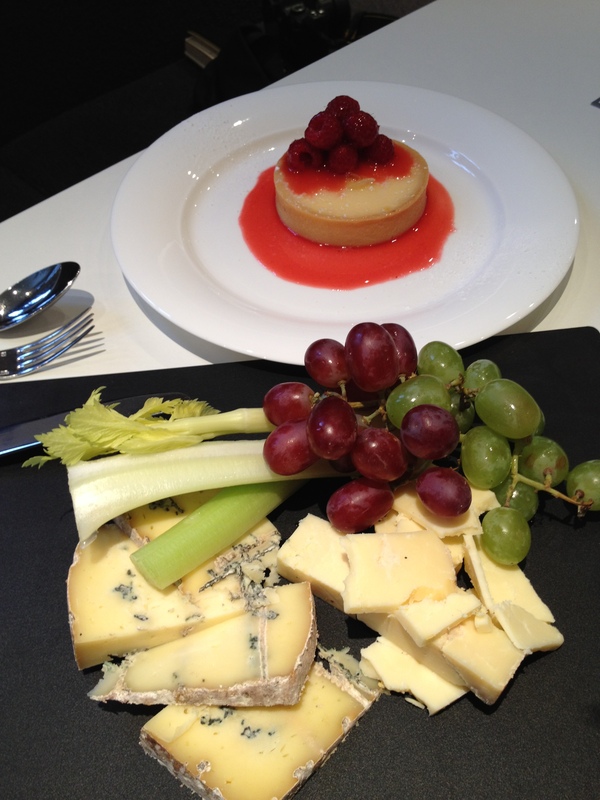 Tart au Citron & a selection of British Cheese, the Cornish Blue & Quickes Cheddar put the Tarte au Citron into the shade and I wasn’t too keen on the Spanish Moscatel @ £7.99 50cl (with the tart not the cheese!). This is a brave move by Morrisons using the pop-up trend to launch a ready meal range and they have pulled it off very well, great location, super service and fab restaurant quality food, all in all a fantastic lunch that I would of happily paid for! If you fancy trying any of the above yourself you may still be able to make a free booking at one of the venues on the M Kitchen website otherwise try them yourself at a Morrisons supermarket near you. Can’t believe I just said that! I also managed to try the Chorizo in red wine as when chatting to the lovely ladies on the next table they insisted! and very good smokey mini chorizo they were. 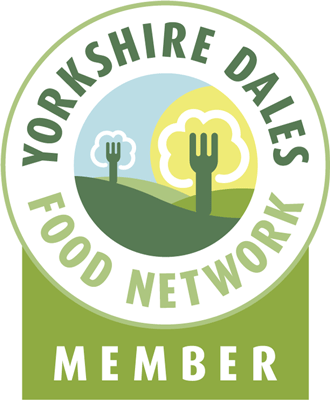 This entry was posted in Eating, Events, Food, New Products, Steak, Yorkshire and tagged Aldo Zilli, Atul Kochhar, Bryn Williams, chorizo, Lancashire Hotpot, Leeds, M Kitchen, Morrisons, nduja, Nigel Haworth, Pierre Koffman, Pop-up, restaurant, Salsiccia. Bookmark the permalink.